2 more days and I'm done with school! Thank goodness because the last few weeks have been exhausting. So glad that my reports came back with no errors and my principal said he enjoyed reading them! Yahoooooo!!! I always worry that I say the right thing about a child. Hopefully the parents and their child will appreciate them too. I'm pretty happy to be coming back the next year and already have loads of ideas and improvements. But what I'm really looking forward to is the time to cycle, read, stitch, catch up on blogs, and all that summer brings. Lots of things to share with you today. I have been overly blessed as of late and have been chosen by hubbies, pets and fate to be the winner of a number of giveaways. First, I was chosen to be the next recipient of the traveling sisterhood's "Life's a Stitch" chart from the sweet Valma! I've followed this chart for awhile. So glad to be given the chance to stitch it. I will be literally traveling while stitching. I'm off to a family reunion this Saturday and will be visiting the family for a couple of days, then back to the mainland the following weekend. Can't wait! Here's the fabric and floss toss. Not sure if I will make it into a box or finish it as a pillow. I'll decide when I'm done. When I get back from my trip, I will do a post to pass it on to the next person. Then, I was very lucky to receive one of Lee's exquisite beetles. I just fell in love with the enchanting creatures when I saw them on her blog. She is so very talented with embroidery and stump work. The beetle may end up on a magnet or I may make it into a brooch. Thank you so much Lee!! Last, but definitely not least, my name was drawn to win Jeanne's, from Willow Tree Stitcher, massive giveaway! I've followed her blog for awhile now admiring her stitching and sewing, which are both impeccable. To say I was overwhelmed is an understatement. She made me one of her lovely project bags and I've been looking at her sewing skills...wow! My hubby is impressed with her ability to sew straight, unlike me O.O She sent me loads of charts, some linen, Vikki Clayton silks!, and a couple of kits all ready to go. I will be tackling a couple of these charts this summer for sure! Thank you again Jeanne!! Now for a pic of my IHSW stitching. I completed the border and it sort of matched. I had to fudge it a bit but I don't think anyone will notice at all. Put in some more blooms and filled in grass. So nothing terribly exciting. I'll apologize ahead for the wrinkles. That's all the stitching I have done. Those flowers take me over an hour to do for some reason. Jane's flowers took my 40. Hmm. Maybe I've slowed down a bit. 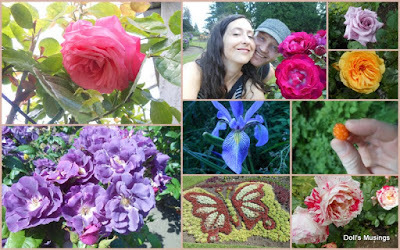 Onto other news, my hubby and I finally had a day off together with some sunshine, so we booked it over to Stanley Park and enjoyed ourselves smelling roses, eating salmon berries, hiking, talking, just enjoying ourselves. Enjoy the photos. I love crows and can't resist a good photo opportunity with the black birds of the sky. That's all until I get back from the Doll family reunion. Thank you so much for commenting on my last post. I didn't have time to respond to all of your lovely comments but I appreciated all of them so much. Bless you all and happy stitching!!! awesome giveaway, you area lucky lady! Beautiful stitching, a lot of detailed work. I hope your summer is everything you hope it to be, Anne. You have been blessed with your wonderful wins. Thanks for sharing your lovely pics. The times we spend with our families are the BEST! Wonderful goodies, have fun stitching! Love that flower border on your wip, just beautiful! That is an enviable stash! So excited for you to finish school, I remember how I felt last year when summer break came (and report cards were done!). I love the beetle, so creative! A post full of beautiful things Anne, enjoy your well earned holiday. The photo of the crow amidst the green of the tree is great. wow, you are spoiled ;) And i think you made good progress on your Ihsw-work. So pleased you got all your school reports done and you got top marks from the Principal! WOW! that certainly is some giveaway and I should think will last you the whole of the summer hols and beyond! Yours photos are lovely, I enjoyed looking at them, such lovely sunny weather too. Wow, what a great giveaway!! congratulations on your win, I think you're going to have heaps of fun with all that lot! Can you say Jackpot?! What lovely new stash from your blog friends. 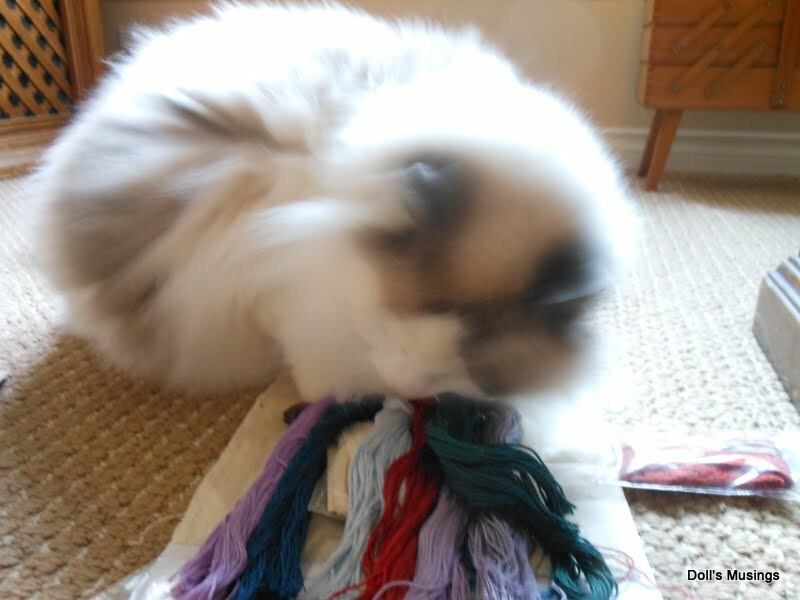 You are making great progress on your sampler. I love your outing pics from your day out with your hubby. So glad that your reporting went well at school. Have a great tie at the reunion. Hugs to you and Titus. So glad your reports went well. Your IHSW stitching is looking beautiful. Congrats on winning lovely giveaways! I am envious! I wanted a beetle by Lee too!! Fabulous right? You have been truly blessed with so many giveaway wins :) All are lovely and I know you'll put the goodies to good use! Wow... you've really scored in the contest department lately. Always fun to do a traveling pattern to connect your with the stitchy world. And you gotta love anything from Lee, the master needlewoman! Your sampler is showing great progress. So pretty. Yea for summer and have fun at the reunion! Woohoo, what a wonderful win - enjoy! And the sampler is coming along beautifully. Oooh, what fabulous goodies you won! Now your problem will be which one to start first.....a good problem to have! A great thing about teaching is summer time to do all the fun things life brings. Enjoy!! I love the photos of Stanley Park. We have only been there one time and it was nasty weather. I'd love to go back! Wow is right!! Looks like you will have plenty to keep you busy this summer. :) Such a pretty sampler - I especially love the border! Have a great time at your reunion! Wow indeed! The Stitchy Karma Gods have been smiling upon you, LOL ;) Hope you have a wonderful reunion! Wow, you really have been lucky! Yay! And your Hannah is gorgeous! I'm glad you could do a small fudge and make the border meet. Whew! I know all your efforts with the report cards are greatly appreciated by all. My father recently sent me some of my old school papers, among them one or two of my report cards from elementary school. I treasure those report cards from my old teachers. I'm sure your report cards will be the same someday for your students. Fabulous giveaway stash you've won! If you weren't at SABLE before, you are now! Lovely progress on in WIP, and I love your park photos! Gorgeous giveaway wins. Looks like you had a great day out with hubby. Lovely stitching. what a fun, lucky pattern ! Lee's beetles are really amazing ! Wow, you're been one lucky lady in the mail department. That giveaway from Jeanne is amazing! I'd be like a little kid in the candy store. The beetle and the traveling pattern look fun too. I am sure you are happy to bring the school year to a close and get some relaxing done! Great progress on Hannah. Have fun at the reunion! Even when you love teaching it's an exhausting job and you need a little break every now and then to reload the batteries, lol. So enjoy your holidays! Mine will only start by the end of July and I'm already very impatiently waiting for them. Wow, that was one amazing giveaway win!! The beetle is amazing too. I don't think I've ever seen anything like it. Congrats on a successful school year and enjoy your much deserved rest. Congratulations on being so lucky, especially Jeanne's giveaway.. Wow! Your stitching is beautiful. Great job on the border especially! You should see my name on the list of Travelling Stitchers for that one! Congrats on the good report for your good reports. And what an amazing haul in your giveaway, lucky you! Hey honey!!! Hope you're having a fab time at the reunion!!!!! Love the pics... esp the one of you and hubs with the roses!! !